We all know how easy it is to spread and pick up disease in this wintry post-festive germ fest they call January. All you have to do is look at someone with the lurg, and in an instant you’re shivering under the covers with only your hot water bottle and Netflix for company. And what’s the secret weapon in this open-season germ offensive? The hands-free cough assault? The colleague-directed sneeze volley? The post-splutter hand-shake? Actually, it could be something way more sinister. Time Magazine recently published an article with the unsettling title: ‘Your Cell Phone Is 10 Times Dirtier Than a Toilet Seat. Here’s What to Do About It’. Eww! Who’d have thought? Yes, it seems your phone could be doing even more to spread disease around the workplace than all those times you’ve skimped on the hand sanitiser. The National Center for Health Research asks the question: are there more bacteria on computer keyboards than toilet seats? Tech Insider is curious in its Youtube Video about what bacteria, pathogens or anything else is living on our phones. 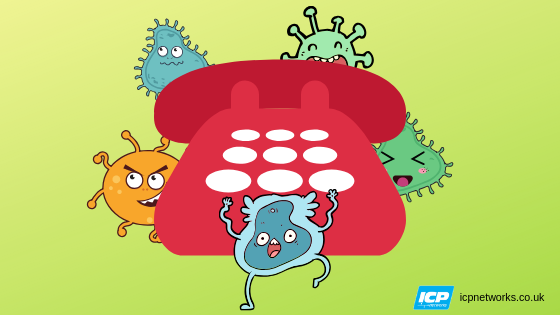 According to Safespace, most germs, bacteria, and diseases living on hard surfaces like your phone can survive for up to 24 hours. That’s a lot of time for personal growth and development. Eww. (Again). It’s reassuring to know that #PhonesInLoos isn’t trending on Twitter, and for good reason. The top tip is not to take your mobile with you when you powder your nose. For a start, multi-tasking comes with its hazards: you may find your device takes an unexpected splash in the pan. And, as the John’s a breeding place for air-born germs, your phone may well pick up some unwelcome guests while you’re in there. If you really can’t be separated from your socials while you do your thing, then at least make sure you regularly clean your mobile device with an alcohol-based wipe. We wash our hands regularly, and after sneezing. What about the phone, mobile or keyboard? Always have a pack of alcohol-based wipes to hand so you can keep your devices germ-free by giving them a regular rub down. These wipes can also take the place of hand-washing if your hands are not visibly dirty or greasy. Turn your keyboard upside-down to empty debris from between the keys. If you’ve got a can of compressed air, use it to blow any debris out from in-between the keys. Dampen a cotton bud or swab with water or isopropyl alcohol. Make sure it’s damp, not wet. Use it to clean in-between the keys. Dampen a lint-free cloth with your chosen cleaner. Again, make sure it’s damp, not wet. Wipe down the rest of the keyboard with the cloth. For a deeper clean, mixing a combination of 2 parts water and 1 part rubbing alcohol works very well. Mix the ingredients together, dip in a cotton bud or cloth, and wipe gently across your device, keyboard or handset. Keeping your phone out of the bathroom is a good idea (it might get wet). If you want to clean it, try just wiping it with a soft microfibre cloth. This surprisingly simple hack will remove a lot of the germs. Remember: most things don’t have to be sterile to be safe. There are bacteria all around us, and most of them won’t make us sick. 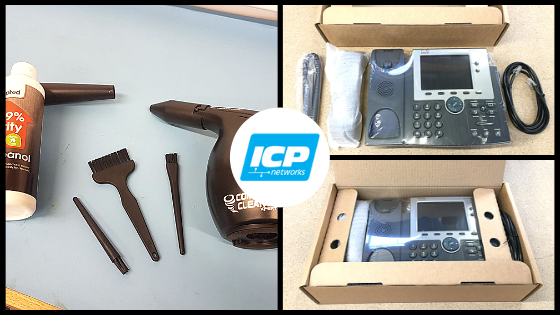 When your Cisco phones or Avaya phones need upgrading or renewing, pick up your (now squeaky clean and hygienic) phone, and get in touch. We’d love to talk to you. Previous Post:The serious business of building trust with our customers.